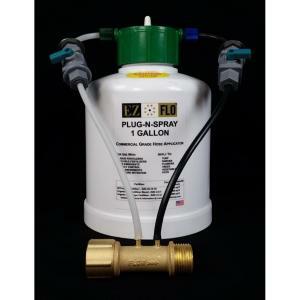 The EZ-Flo Plug-n-Spray is a high capacity portable commercial injection system that is all you need. Not only for liquid and water soluble fertilizers, but pre-emergents, weed killers, insect control, animal repellents, soil conditioner and moisture managers also. Cover more area, much faster, than other manual sprayers. This unit is a high flow system for connecting to your garden hose or hose bib, not intended for drip irrigation systems. High temperature environments (where summer temperatures exceed 100° F (38° C) ) in combination with high water pressures may also cause PVC plastics to weaken and the Products to fail. Permanently installed fertigation units should be located in a valve box or other suitable location out of direct sunlight to minimize risk of failure from excessive heat and from the degrading effects of ultraviolet radiation. Please Note Warranty Limitations: EZ-FLO hose Plug N’ Spray will fracture tank seam if subjected to constant water hammer and may not be installed into an irrigation mainline before zone valves. The 1000 series injectors may be installed before a garden hose bib timer where water hammer is not present. Please make sure that all water pressure is relieved from the system by relieving the pressure on the hose or sprinkler unit when not in use. In addition, a 1000 series hose and drip unit subjected to operating pressures above 80 PSI will not be covered by Manufacturer Warranty.